Does my AVI look like the Texas Band uniforms????????????? nonesy - The whole Nick Fairley thing is a made up issue. He got tackled and knocked into the GA QB's shin.....not his knees. And on the other hit, Nick was already in the air when Murray let go of the ball, and he couldn't stop. He didn't see that the ball was gone in time. He weighs 300 lbs, so it's not like there was much he could do. It was only a couple of seconds late, but he got flagged for it, and that was OK. He didn't start out to make a late hit. All the Auburn hate is just unprecedented and very undeserved. A Bama Grad Assist. who used to be an Assist. AD at MSU has been interviewed by the NCAA, and inside info has it that the FBI removed some computers from the Bama athletic complex on Friday. Bama says no comment. That Southern Miss story is just heartbreaking. But we hear about this kind of thing just about every season. I wish these kids would be a little more careful with their lives, but they have no concept of danger at that age. Clubs, drinking, and weapons are an awful mix. It's always trouble for somebody.I have those kids in my prayers. I feel awful for them. That Saban tape made the rounds down here too. I just don't like his coaching style. He always seems to be on the edge of losing complete control of his temper. It makes me nervous for those kids. I guess they don't mind it. Bo Pellini and Nascar would be a great pairing! beans...make a call!!! I agree !! Bean please make the call !!! I watched the entire game last week and the replays that have been sent all over the internet of Fairley's hit - and also the replays of the over-the-edge hits delivered on him by UGA as well. It was an emotional and tense game, this stuff happens. I think the tenor pitch by UGA with all the protest probably has much to do with the fact that this game determined their bowl eligibility. With the way UGA started their season and the absence of suspended Green, that really determined early on they were risking their bowl eligibility IMO. Don't know if you knew this, but that GA's puter might have also been reviewed additionally because the NCAA had already protested Saban's many "interns" before the season even began. It seems he had several more than the NCAA allows, for they only allow 2 GA's and 2 quality control. I also feel sure that GA didn't welcome the scrutiny or issues following him from MSU either. All that's coming out now about Bill Bell and Kenny Rogers should play very poorly for MSU and has me wondering if this is why they drug their feet in responding back to the NCAA post the initial report in January? Why are former players there so involved in recruiting ????? It's widely known that former players and/or boosters cannot approach or discuss recruiting with recruits. I'm guessing those are rules that MSU feels they aren't accountable for? Or have they opened pandora's box? It also seems staff at MSU have not provided concrete evidence yet of Cam's father ever stating directly to them in word, phone call, or text that there was a 'price' for Cam. Isn't it ironic to hear Bell's cell phone containing the incriminating texts are unavailable because his cell phone has water damage? Anyway, perhaps the FBI can get to the bottom of this, for it's time to stop the media madness. PDH, as for Saban smacking his QB on the behind on national TV, I do think it makes him look a bit ridiculous. wreck you changed your avi !!!!!!!!!!!!!!! I liked it !!!!!!!!!! i know i should post this in the natalee thread but since i only log in once a week now, i would never find the answer...so...you guys let me know what you think. i see a lot of people think if the jawbone is indeed natalee's that it was a plant (btw.....hubby thought the same thing right away)......wouldn't the forensic testers be able to tell if the bone had been emersed in salt water for a long time...or buried in sand for a long time? just got me to thinking...and yes.... i hope it is hers for all our sakes but i sure as hell don't want aruba to get joran. we play at mississippi state this weekend....another tough roadtrip in the sec west....ugh!!! Yes, they would be able to tell, the question is WOULD they tell? Wreck... whew.. you did look very Texas-y. Cuz, thinking of you and hoping that there is some closure in the future. Guess we'll know before long. Hey cuz! Nice to see you. Good Luck with MSU! Right Cuz? Good luck girl! Wreck I noticed what you said about the hat in the Natalee tread. ::CowboySmiley::besides your hat is orange. 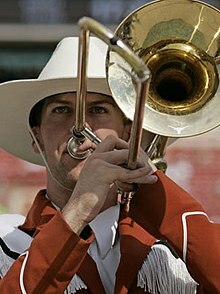 The Texas band guy has a white hat. Keep the avi! I made a comment about archiving dental casts digitally for missing persons in Natalee's section and everyone logged out! I read it and thought it was a great idea. I'm a lurker over there though because that case has worn me out. I said it all already and ALE just pisses me off. I am with Wreck... it doesn't matter if the bone belongs to Natalee (except to her family) because nothing will be done about it. I am counting on Peru to make sure he gets his payback. So who is everyone playing this week? We play TX A&M. Wreck plays KS right? That's all I got. Good luck to all. Play safe and fair. Be careful with the Aggies -- they have new life under their new QB!! Hope to see you all in a rematch!! I read it and thought it was a great idea. I'm a lurker over there though because that case has worn me out. I said it all already and ALE just pisses me off. I am with Wreck... it doesn't matter if the bone belongs to Natalee (except to her family) because nothing will be done about it. I am counting on Peru to make sure he gets his payback.So who is everyone playing this week? I don't want Aruba even attempting to try Joran. They will try to spin it as though they are the heroes. Let Joran die in Peru with Natalee at home in Alabama to rest. I'm asking gingerly................. how is the Cam Newton situation shaking out? It is not looking good in the press (but, that means nothing! ).